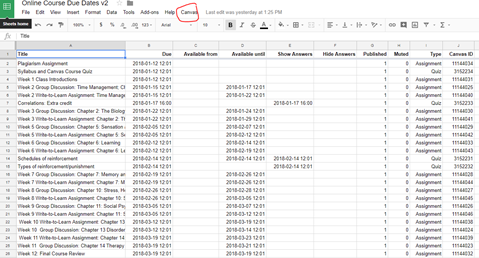 You will see all of your course assignments in a single Google spreadsheet. Adjust the dates on the spreadsheet. Two clicks later, and all of those due dates will appear in your Canvas course. I see that incredulous look on your face. Pretty awesome, right? Jones created a Google spreadsheet that you connect to your Canvas account using API (“application programming interface”). Canvas makes it easy to get an “API access token;” you create it in your account settings. That will give your Google spreadsheet permission to access data in your Canvas account. Next, you tell the spreadsheet which course you want it to access by pasting in the url for your course – just open your course and copy the url from your browser’s address bar. Then in the “Canvas” menu Jones put in that spreadsheet, select “Load due dates” and all of your assignments and current due dates will be downloaded to the spreadsheet; you can watch as each line is populated. Now, make your changes using the same date/time format. When you’re done, in the spreadsheet’s Canvas menu, select “Save due dates” and your new due dates will be uploaded to your Canvas course. Reload your Canvas course, and, like magic, your assignments will all have the new due dates. Jones created an excellent set of instructions. Just do what he says. In step 4, you may have to “authorize” Google when you try to “Configure API Settings.” If so, just use whatever Google account you want to use. Once Google is “authorized,” then select “Configure API Settings” again. As a heads up, when you follow the instructions to get the API access token for your Canvas account, you will likely have to scroll down on that Canvas page before you see the “New Access Token” button. Of Jones’ other Canvancements, I’ve installed “Sorting Dashboard Course Cards” so I can put the dashboard cards in the order I want, “QuizWiz” so I can save a rubric score or comment AND advance to the next student at the same time, and “Sorting Rubrics Made Easy” that (finally!) lets me move around the criteria in a rubric.